This week players at Party Casino have the chance to win a massive $3000 cash bonus just by playing at the casino. 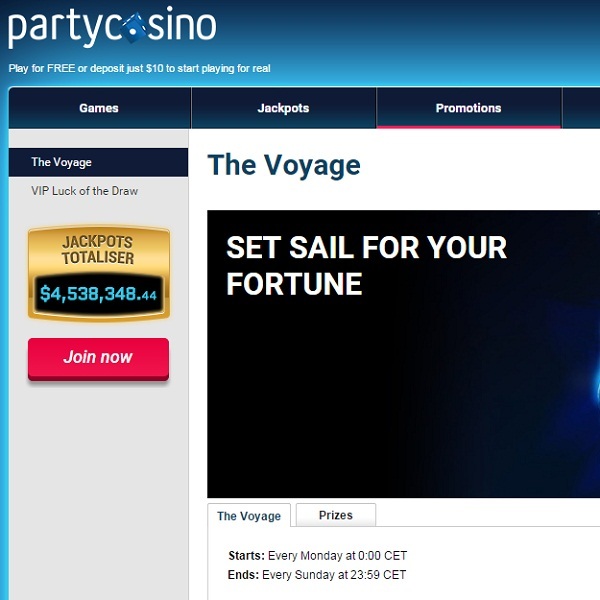 Party Casino’s Voyage Promotion sees players compete to climb the leaderboard and obtain a higher rank on the good ship Destiny. Each Sunday the prizes are then divided between the ship’s crew and the better your rank the bigger the prize will be. The top of the leaderboard will receive a $3000 cash bonus if they are a VIP player or a $1000 bonus if they are regular players. Second place receives either $1,000 or $500, third place will receive $500 or $250, fourth place receives $250 or $100 and fifth place receives $100 or $50. In total 10,000 players will receive cash bonuses and they vary in size between $1 and $3,000.